Congregation Torat Emet is excited to announce that Chazan Dovid Weinberg will once again be leading the congregation in High Holiday services. Chazan Weinberg certainly lives up to his reputation for the ability to combine popular melodies and traditional chazanut. Born in Jerusalem, Chazan Weinberg studies nusach with his father, Rabbi Noftoli Weinberg, and with the world-renown chazan, Moshe Stern. He is the permanent chazan at Congregation Ohel Yitzhak in Jerusalem and a guest Chazan at the Great Synagogue in Yerushalayim, the Yerushun Synagogue and other congregations throughout Israel. 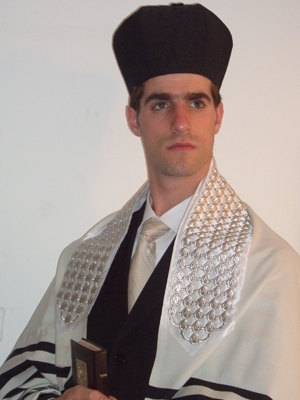 Chazan Weinberg is often called to synagogues and programs in Europe and in other cities in the US. Prior to his work at Torat Emet, he led the High Holiday Services at Congregation Shaarei Tefilah in LA. He lives in Jerusalem with his wife, Bracha, and their children. When not busy with Chazanut he works in advertising.